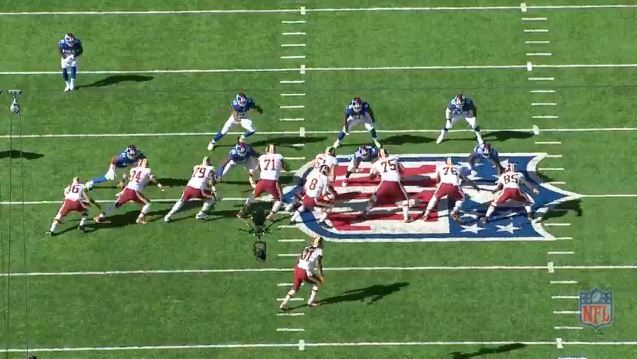 After the Redskins’ victory over the New York Giants last Sunday, it was understandable that the left side of the offensive line would receive the bulk of interest. Center Kory Liechtensteiner (who was put on Injured Reserve Tuesday) left the game with a calf strain, Shawn Lauvao left the game with an ankle injury, Spencer Long took over snaps at center and Trent Williams moved from left tackle to left guard to fill the void while Ty Nsekhe moved to left tackle for Williams. Overlooked in all of this was the steady play of right guard Brandon Scherff, who played all 71 snaps and, according to Pro Football Focus, was the best right guard in the NFL in Week 3 with a grade of 82.9. “Scherff didn’t allow any pressure on 41 pass-blocking snaps, and only a holding penalty kept him from an even higher grade," they write. 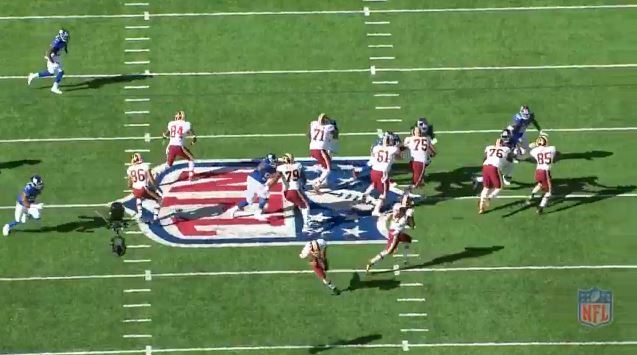 Scherff was also strong against the run. 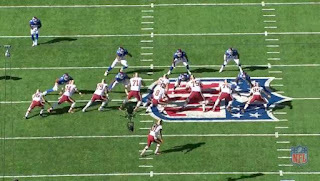 A good example came in the third quarter (below), when he led the way for running back Matt Jones on a 5-yard gain to the right. At first he latches on to defensive tackle Jay Bromley and then passes him off to Long before attacking middle linebacker Kelvin Sheppard. 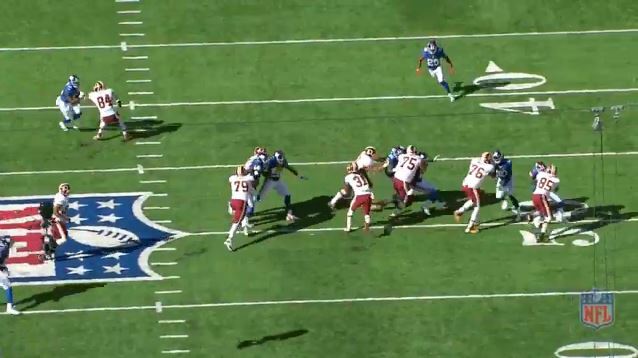 He’s able to use Sheppard’s momentum against him to create a hole for Jones to run through, just missing a bigger gain. This will be another important week for the offensive linemen as they aim to get new center John Sullivan up to speed, after the Redskins signed the veteran to a contract on Tuesday to replace Lichtensteiger's spot on the roster. The time-honored cliches, “speed kills” and “you can’t coach speed,” are true. The fastest NFL players can shred the perfect defense and go the distance on any given play. Opposing teams must account for these electric performers at all times. This extra attention creates space for all offensive personnel to go to work. On the other side of the football, speedsters can play lock-down, man-to-man defense and chase down plays from the weak-side across the formation. A real burner will put in spot duty on special teams as a return man when the team needs a spark. Football speed, in pads, is different than straightaway speed measured with a stopwatch on a fast track. Even the great Jerry Rice ran a rather pedestrian 4.71 40-yard dash. On game day, however, he flashed wide open on drag routes across the middle before hauling in the football, turning the corner, and racing upfield past the defense for six. Alternatively, Darrius Heyward-Bey’s professional career never got off the ground despite literally breaking stopwatches at the NFL combine. The following current NFL players represent the ideal combination of lateral quickness, acceleration, agility, and raw top-line speed. This is (almost) unfair. Julio Jones measures out at six-foot-three and 217 pounds — and he is bigger than Adrian Peterson. At the combine, Jones clocked in at 4.39 in the 40-yard dash as the most physically gifted wide receiver to enter the draft since Randy Moss. Yes, Jones is faster than Antonio Brown and Odell Beckam, Jr., who are both burners in their own right. The 27-year-old is a matchup nightmare. As a possession receiver, Jones can use his big body to wall off defenders on slants and quick outs right at the sticks. On wide receiver screens, he will haul in the pass, before throwing out a stiff-arm on the defensive back and racing down the sidelines. In response, defensive coordinators will often call for Cover 2, with a corner cheating up toward the line of scrimmage being backed up with safety help over the top. Still, Jones can easily outrun this double coverage before quarterback Matt Ryan drops in a deep bomb. For his career, he is averaging 15.1 yards per catch as the ultimate big-play threat. Last year, Jones led the league in both receptions (136) and yards (1,871). Ironically, the top-end speed was on full display when he found himself as a defender, chasing Tampa Bay linebacker Kwon Alexander 85 yards downfield to stop a pick-six. At 30 years old, DeSean Jackson is still one of the fastest men in the NFL. He ran a 4.35 in the 40-yard dash at the NFL combine. Then the Philadelphia Eagles picked him in the 2008 draft. Jackson was at his best in 2010, when he paired up with a reinvigorated Michael Vick to torch the competition. That year, Jackson came down with 47 receptions for 1,056 yards — a blistering 22.5 yards-per-catch average. For the play of the year, Jackson actually muffed a punt against the New York Giants, before picking the football back up at his own 25. From there, he drifted to his right, before feinting back to the left and turning on the jets upfield. After shaking two tacklers and hurtling over the punter, Jackson got a block and turned on another gear at the 50-yard line. 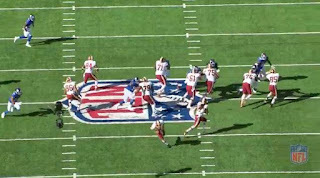 From there, he was so far behind the Giants coverage that he actually tiptoed horizontally alongside the goal-line to run out the clock before scoring the touchdown. The Philadelphia Eagles won this game 38-31. A irate Tom Coughlin screamed at punter Matt Dodge for actually kicking the football to Jackson. Matt Dodge found himself out of a job immediately thereafter. For his career, Jackson has averaged 18 yards per catch to go with 50 total touchdowns, as a receiver, on the ground, and in the return game. For 2016, Jackson will have another big year in Washington, if Kirk Cousins can get him the football. Brandin Cooks is one of the more underrated and least recognized burners in the NFL. Cooks played his college ball at Oregon State, in the shadows of the Mighty Ducks of the Pacific Northwest. Now, Cooks finds himself in another small market. His Saints club that hasn’t made the playoffs through his first two seasons. Still, Cooks is only 23; he has plenty of time to play pitch-and-catch with Drew Brees on the Superdome fast track — and introduce himself to fans. Cooks is often compared against Rams wideout Tavon Austin in terms of both speed and stature. On paper, both of these athletes measure out near 5-foot-9 and 180 pounds and run a sub-4.35 40-yard dash. In real time, however, Cooks does show better acceleration; he is one shade quicker in and out of his breaks as a route runner. For this, Cooks hauled in 84 receptions for 1,138 yards and nine touchdowns last season, while obliterating concerns that he was a one-dimensional speedster. For Week 1 this year, Drew Brees hit Cooks in stride from the back of his own end-zone. Cooks then sprinted down the sideline and celebrated capping off the 98-yard pass play in front of a raucous New Orleans crowd. Patrick Peterson is the closest thing to Deion Sanders we can get. Peterson already admitted to modeling his game after Sanders, right down to the high-stepping and flashy touchdown celebrations. For a more direct comparison, he may be one small step slower than Deion. However, he is a much more physical presence and willing tackler out on the edge. Either way, both Peterson and Deion Sanders were ready for Prime Time, after clocking at 4.34 and 4.27 in the 40-yard dash, respectively. Peterson is at his best in press coverage, when he will line up directly across from the other team’s best receiver and track him all over the field, with no safety help over the top. Last year, in Week 6, Peterson limited the flashy Antonio Brown to only three catches for 24 yards. Taken together, Peterson and the Honey Badger form the best secondary in football this side of Seattle. These two already combine for 27 interceptions and six return touchdowns well before the age of 30. The Cards have one of the best defenses in the league again. Jones is pressuring the quarterback off the edge and Peterson is jumping hot routes out in the flat. He will remain in the game to field punts after harassing the opposing offense into yet another three-and-out. In the return game, Peterson will set up his blocks beautifully, before weaving in and out of traffic and hitting the turbo button to daylight. 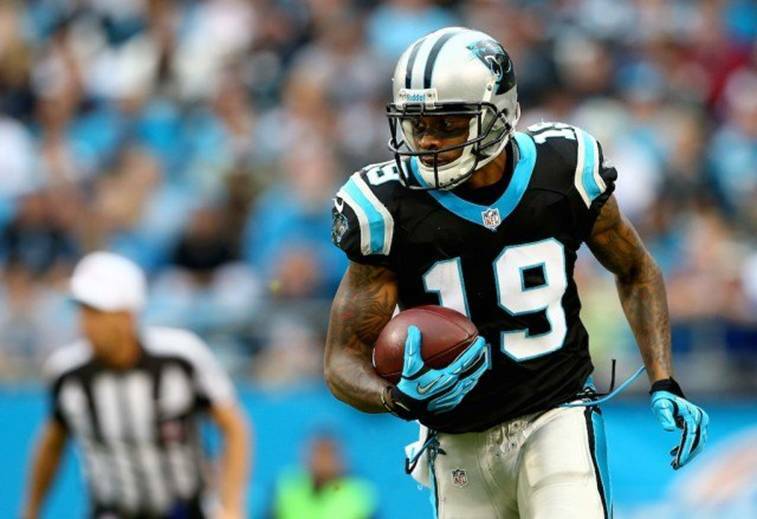 Ted Ginn Jr. would have emerged as the latest track-and-field star, if it were not for football. In high school, he won the state title in 200 meters and the national championship in the 110-meter hurdles. As a high school senior, Ginn did clock out at 10.2 in the 100-meter dash, which was already then a mere four-tenths of a second off the record pace of Usain Bolt. Ohio State actually recruited Ginn to run track. Then coach Russ Rogers believed that the Cleveland product had a chance to make the 2008 Olympics. Ginn, of course, dedicated himself to football instead. As a Buckeye, Ginn kicked off the 2007 BCS National Championship Game by taking the opening kickoff 92 yards to the house against Tim Tebow and the Florida Gators. Ginn, however, sprained his foot beneath the dog-pile in this wild celebration and still wore a cast through the ensuing NFL combine in Indianapolis. If not for this freak injury, Ginn was all but set to run a sub 4.3 40-yard and challenge the combine record. Still, he went to the Miami Dolphins as the ninth overall pick in the 2007 draft. For his second year, Ginn had racked up 56 catches for 790 yards, before landing in San Francisco. As a 49er Ginn was well behind Michael Crabtree, Mario Manningham, and even a 35-year-old Randy Moss on the wide-receiver depth chart, while also competing with Vernon Davis for touches. 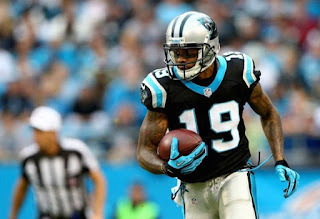 As a return man, Ginn took three touchdowns to the house through three years in San Francisco. He is at his best in Carolina, where he is the primary deep threat for Cam Newton. The Panthers offense has been all but unstoppable, with Ginn stretching the field; Kelvin Benjamin towering over the secondary as a big target; and security blanketed Greg Olsen working the soft zone underneath. After establishing the run, Carolina can go play-action, with Newton rolling out to his right before going over the top to Ginn on a post pattern to blow the game wide open. Ginn has already carved out a 10-year career for himself as the fastest man in the NFL. If you’re looking for a man to credit for the 3-0 start, look no farther than Dean Pees. The Ravens defensive coordinator is making the most out of improved personnel and is pulling the right strings. The Ravens offense has struggled. The defense is once again carrying the purple and black. The defensive unit is doing a great job of getting off the field. Ravens opponents are 17-44 on 3rd down conversions. That is just over 38 percent. The Ravens have sacked opposing quarterbacks nine times and have five interceptions. The offense may be struggling but they have earned 16 more first downs than their opponents. After three weeks of the season the Ravens have the second ranked defense in the NFL. Against the pass the Ravens are third. While the Ravens are 8th against the run. Remember, Isiah Crowell had one big run against the Ravens. It was the only big play the Ravens have allowed on the ground. If Baltimore continues stellar defensive play they should finish in the top 10 of both categories. The purple and black now have a top tier defense. Points are everything in football. The final outcome of the game is all that really matters. The Ravens have given up 14.7 points per game; a total which equals fourth best in the league. The Cleveland comeback was evidence that Dean Pees is playing an important role. In prior seasons when the Ravens defense struggled the bleeding never stopped. Pees made obvious adjustments that helped win the game. Talent is one thing, but when you pair it with good coaching the results are so much better. Credit has to be given to Pees. Pees is mixing up his looks. When he has confidence in his players, you see his play-calling lean on the bold side. The Ravens secondary was a big problem for the Ravens the last few seasons. Now he no longer needs to rely on a passive zone coverage. He doesn’t need to live in constant fear of the big play. When the Ravens secondary was a problem he let teams pick apart the defense slowly. With Eric Weddle and Lardarius Webb playing incredible football, the sky is the limit for the Ravens defense. Now the Ravens have more flexibility in their defensive play calling. On the other side of the ball, the Ravens have all the talent in the world and have mostly seen complete stagnation and frustration. Yes, the offense has delivered some big plays. However when you look at this team, one side of it is completely carrying the weight. The Ravens improved talent on both the offense and the defense. Thus far it is the defense that has taken steps forward. If Pees didn’t change his tendencies in accordance to the players he has at his disposal, the defense would have struggled too. Many people thought that Pees should be fired after the 5-11 season. It’s not like I was running the Dean Pees fan club. It looks like the Ravens were in the right by keeping him in the mix. 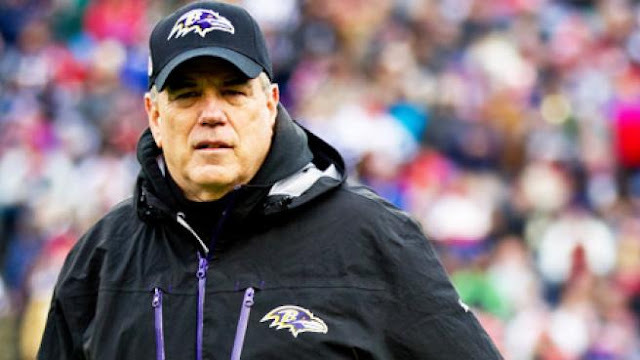 It is becoming clearer every week that Ozzie Newsome and Eric DeCosta have addressed the real problems with the Ravens defense. The talent is there and the Ravens are winning. One change that has been a great move is having Pees on the sideline. Now, Pees can communicate with players. When players can tell him what’s happening it behooves his ability to do his job. That’s huge. Defensive leaders like Terrell Suggs and Eric Weddle are helping Pees see what’s happening on the field. The Ravens defense has seen as big of an improvement as I have ever seen in one season. Now, the Ravens surely upgraded the defensive roster. However you can’t have anything but praise for Pees. This season he is proving that given the talent, he can call the right shots. DETROIT — It's been a good start for Riley Reiff and the Detroit Lions in the 2016 season, with Reiff moving to right tackle. The Parkston native has transitioned well to the new position after playing left tackle for the first four years of his career. Reiff has been the league's top right tackle through the first two weeks, according to the football analytics website Pro Football Focus. In last Sunday's loss to Tennessee, Reiff had to leave briefly with an ankle injury and he missed practice Wednesday. The Lions are at Lambeau Field on Sunday to take on the Packers. Lions offensive coordinator Jim Bob Cooter said it's important to have a reliable cog like Reiff in the team's offensive line, regardless of where he plays. "I think the better you feel about certain spots, certain guys in certain spots, the more you can sort of focus on improving on where else you need to improve," Cooter said. We're sort of still getting a feel for each other in different spots, communicating with each other, communicating with the guy next to him. It's something that I expect to get better and better as we go forward, and I think those guys do too." 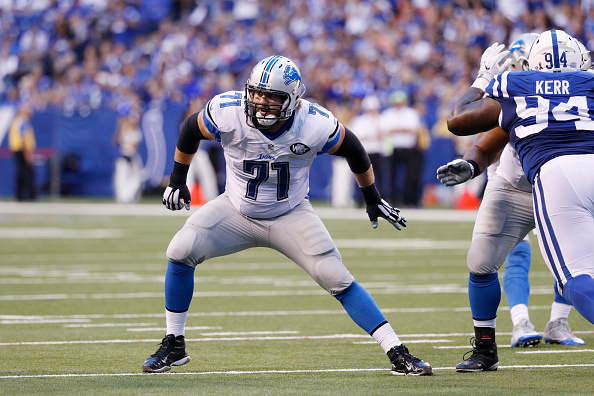 Reiff, 27, is in the final year of his five-year rookie contract since being drafted by the Lions 23rd overall in 2012. If you watched the Baltimore Ravens beat the Buffalo Bills 13-7 on Sunday, one thing was very clear. The Ravens defense is damn good. Against the Bills, the Ravens were relentless on defense. Quarterback Tyrod Taylor spent the game running for his life. During the rare occasions he actually got time to pass, there was no one open anyway. As a result, Taylor finished with just 111 yards passing, which was his second lowest total in the past two seasons. Last year against the Titans he threw for just 109 yards, but he was injured in the game, which caused the total to be so low. On Sunday against the Ravens though, there were no injuries or excuses for why the Bills couldn’t move the ball. Just great defense by Baltimore. Even Bills head coach Rex Ryan was left saying that a very dominant defense had beat them. “Number one, I think that’s a pretty darn good defense over there,” Ryan said when asked what went wrong in the game. Clearly the Ravens had an excellent plan to keep Taylor and the Bills’ offense under wraps. 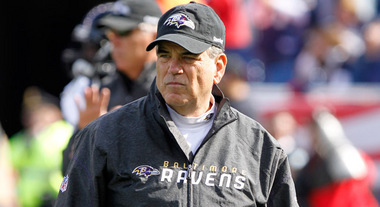 Defensive leader Terrell Suggs gave all the credit to defensive coordinator Dean Pees after the game. Pees certainly did call a good game, but it’s easy to look good when you have the type of talent the Ravens do on defense. The bottom line is that the 2016 Ravens’ defense is the most talented defensive group in Baltimore since the days of Ray Lewis. And the dominance fans got so used to seeing from the Ravens for many years has finally returned. With Suggs and Elvis Dumervil on the edge, the Ravens have the best pass-rushing duo in football. Timmy Jernigan is one of the better young defensive linemen in the game and linebacker C.J. Mosley is arguably the best middle linebacker in the league. And that’s just the front seven. The secondary is where the dominance has truly returned, though. Last season they struggled because they got beat over-the-top too many times. The Ravens are usually known for not giving up big plays and last year they gave up way too many. But the Ravens made major changes to the secondary this year. Mainly, they converted Lardarius Webb to safety and signed Eric Weddle to totally revamp the backend of their defense. And it clearly has returned them to dominance. Now here is the really scary part for every team remaining on the Ravens’ schedule. The Baltimore defense is going to get better. In Week 1, linebacker Elvis Dumervil sat out the game recovering from offseason surgery. He’s expected to return in the next few weeks. The dominant defense we saw on Sunday, will add a five-time Pro Bowl pass rusher to it. Sam Monson breaks down the tape on Marshal Yanda, explaining why the Ravens' guard is the best at his craft. It’s far from a glamorous position, but Marshal Yanda is the best the league has to offer at guard, and has been for a while now. Over the past seven years of his career, Yanda has been in the top 10 at his position every single season, ranking in the top two four times, and at No. 1 in each of the last two seasons. Yanda had another fine game to open the 2016 season against Buffalo (83.3 overall grade, fourth-highest among guards), and will likely be the man to beat again in 2016. What’s perhaps most impressive about Yanda is his robotic consistency. He may be a marginally better run blocker than he is pass protector, but he’s consistently good at both every single year. He was even consistently good when the Ravens needed him to play right tackle in the past; had he been left at that position instead of moved inside, we could be talking about one of the best right tackles in the league, too. In fact, you need to go all the way back to 2009 to find Yanda’s last poorly-graded game at right tackle—and he has started 21 games at that position since then. When he played at that spot every game of the 2010 season, he finished the year as PFF’s fifth-ranked offensive tackle, and second only to Kareem McKenzie among right tackles, specifically. Yanda has never recorded an overall grade under 81.6 for a season. He hasn’t even produced a single bad game for over two seasons’ worth of play. The last genuinely poor performance the Ravens’ guard had was back in 2013 against the Bengals, who managed to give him all kinds of problems despite missing Geno Atkins due to injury. That’s 42-straight games without a bad day at the office. In today’s NFL, that’s a staggering level of consistency, even if the highs weren’t as high as they in fact are. So, what makes Marshal Yanda so good? There’s something common among all great guards, and that’s an ease of movement. Working in the NFL trenches and needing to carry over 300 pounds in mass can often lead to linemen looking a little cumbersome in their movements. Explosive, sure, but at times, it looks like they’re working under a burden when it comes to moving around, and they’re rarely considered agile. The Ravens are running a simple outside zone play to the right side of the line. With only six men in the box, the Ravens like their chances of success, but the play requires everybody to make their block for it to work. With an extra lineman to that side lined up as TE, Baltimore has big power on that side of the line, and three-on-three in the numbers game. The TE and RT have pretty routine assignments, but Yanda needs to be able to work his way across to the DT that is lined up right over the tackle. For a guard to work across and seal a 3-technique DT inside is hard enough, but here the DT is lined up even further outside than that (3-technique is outside shade of the guard, effectively in the gap between RG and RT). The RT puts out an arm to help Yanda get on the block, but by the point he even touches the defender, Yanda has already worked level with him and is well on his way to controlling the block. From that point, his power and technique take over, and he is able to seal the defender all the way to the inside and spring the running back to the third level of the defense, where he is eventually brought down by the safety. Yanda’s quickness and agility here get him in position to make this play, but his technique is also flawless. He gets his hands inside, locks on, and is able to sink his hips and drive to keep the gap controlled and widen the space for the running back. In addition to the movement skills that Yanda has, he also possesses the raw power that every line coach in the league wants to see from their players. There’s a reason even zone teams aren’t stocked full of 285-pound linemen like they used to be, and it’s because the raw power that comes from bigger guys is vital to successfully completing blocks. Getting in position is only so much use if you can’t maintain it and are constantly being squeezed towards the hole, cutting off the running back’s path. When Yanda locks onto a guy, it’s over, even against some of the more powerful players in the league. Take this example against the Dolphins last season. 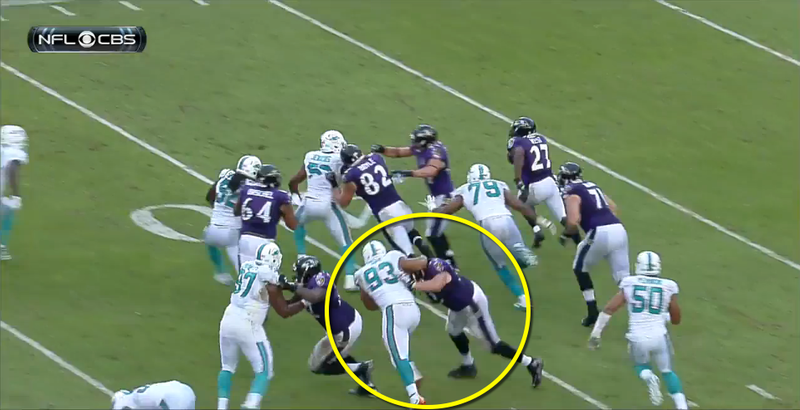 Again the Ravens are running an outside zone play to the right side of the line, and though Miami is defending it a lot better than Buffalo did in the earlier example—and actually strings it to the sideline and stuffs it for no gain—Yanda is busy burying DT Ndamukong Suh, driving him off the line and putting him to the turf 5 yards downfield and well inside of the flow of the play. That’s also a good example of the nasty streak everybody loves to see from linemen. 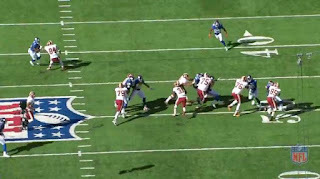 Not content with just driving him to the turf, Yanda follows him down to put an exclamation point on the play. The combination of power, technique, and agility also makes Yanda a perfect fit in either zone- or man-blocking schemes that run a lot of power or gap concepts. Whatever happens in Baltimore from a schematic point of view, Yanda will be well-suited to it, and be able to execute without one aspect of his skill-set holding him back. It’s also why he has been successful both inside and outside at the NFL level. 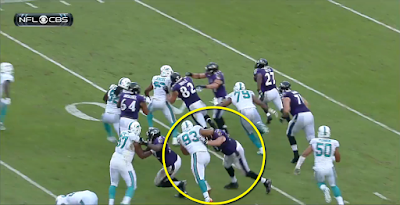 Most players are missing a piece of that puzzle, and that predetermines where their best position is, or what scheme they are best-suited for, but few players are like Yanda and have no real holes in their game. 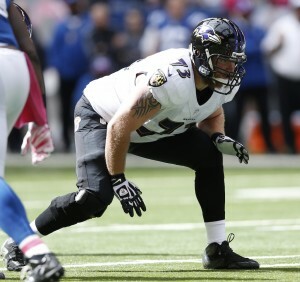 Marshal Yanda is the best guard in football, and one of the best players in the league, period. Here's who got the best of who in the key matchups of Sunday's game. It was a rematch of coordinators from Super Bowl XLVII in 2013, and Baltimore’s Pees came out on top again. This one was a far different game. Roman’s San Francisco 49ers rolled up 468 yards in losing to the Ravens, 34-31, in the title game from four seasons ago. This time, Pees held the Bills to just 160 yards. The Ravens’ two best defensive linemen, Brandon Williams and Timmy Jernigen, were great. And linebackers C.J. Mosley and Albert McClellan looked like they spent all offseason studying the Bills’ power run schemes. McClellan anticipated a pull by Richie Incognito in the third quarter, absorbed and bounced off the block and trapped LeSean McCoy for a 6-yard loss. Pees, 67, has two Super Bowl rings. He earned his first as an aide to Bill Belichick, for whom he worked in New England for six years. 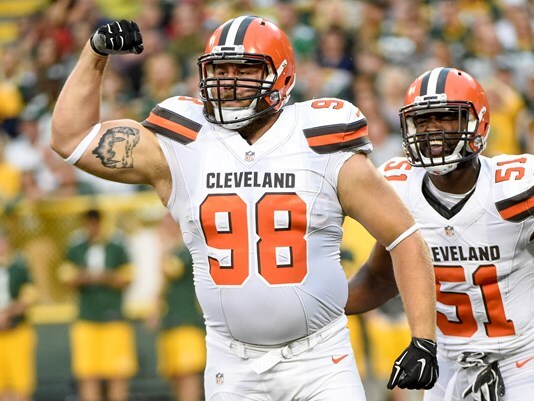 CLEVELAND -- Defensive lineman Jamie Meder grew up in Parma Heights, Ohio, and while playing for Valley Forge High School, he had his heart and mind set on making it to the highest level of football. After a standout career at NCAA Division II Ashland University, Meder played in one game during the 2014 season for his hometown team, the Cleveland Browns. Then, last year, Meder not only made the Browns’ roster out of training camp, but played in all 16 games and made 33 total tackles. Now in his third professional season, the 6-foot-3, 308-pound Meder is looking to build a future for himself in the NFL. Meder got off to a good start in the preseason when he registered a safety the play after Browns quarterback Robert Griffin III threw an interception in the opener against the Green Bay Packers, and finished the four-game exhibition schedule with seven tackles, including three solo stops. “He’s been playing well,” Browns coach Hue Jackson said. “He practices, the guy is very accountable. He’s there every day. He works extremely hard. He made some big plays, football plays by clogging holes, getting people off of double-teams, and then, making plays, making a safety. Meder is playing for his second defensive coordinator in as many years, but is a believer in Ray Horton’s scheme. With Horton’s guidance, the 2013 Browns registered 40 sacks for 185 lost yards and held opposing passers to just 3,723 yards, the lowest total they have allowed in any of the last four seasons, and their 1,781 rushing yards surrendered are the fewest in the expansion era. The last time the Browns allowed less than 1,800 rushing yards in a single season was in 1994, when they went 11-5 and advanced to the second round of the AFC playoffs. It was the one of the best defensive turnarounds in Browns history, as they went from 23rd to ninth in total defense under Horton’s leadership, which marked the team’s best overall performance since 1994, and their opponents’ 3.9 yards-per-carry average was their lowest allowed total in 18 years. After spending the last two seasons as the Tennessee Titans’ defensive coordinator, Horton takes over a defense that surrendered 6,067 total yards, including 2,055 on the ground and another 4,012 through the air in addition to 49 touchdowns and forced only 11 interceptions this year after collecting 21 during the 2014 season. “I think it’s better for our whole defense in general, not just me,” Meder said. “Everybody’s making plays. Time will tell when we put more wins on the board. Coach Ray is going to put us in the best position. I think it goes back to us with our new attitude. We’re pushing each other. We’re just getting after it every day.